Specializing in all things kayak related, Green Adventures offers kayak rentals, guided kayak tours and kayaking lessons and instruction. Develop confidence in your paddling skills with a lesson by a Green Adventures expert. 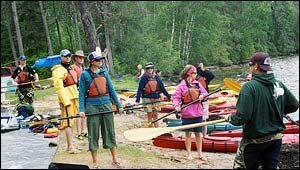 Paddle Canada has developed recreational kayaking standards on a national basis and implements an instructor base to deliver certification programs nation wide. Kayaking is very easy to learn; with the assistance of our guides, you’ll quickly feel right at home at a skill level adequate to fully enjoy your adventure. As part of the Paddle Canada teaching format, paddlers are taught the technical skills to help them experience safer and more enjoyable recreational paddling experiences. Scott Green is CRCA Level 1 and Flatwater Instructor certified. Included: Instruction by knowledgeable CRCA level 1 and flatwater instructor, kayak rental, safety gear. Sturgeon Falls offers over half a dozen outstanding surfing waves. This is a safe place to play. Since there are several waves to explore you can choose the path of your desire. You can sea kayak from the top, work on paddling skills or rescues. There are great places to practice “eddying in” and “eddying out”. This rapid is great place to push your limits or perfect your skills. This location can be easily packaged with a camping trip and is great for canoeing and kayaking. 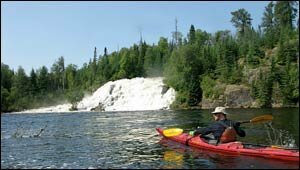 Sturgeon Falls is visited by white water enthusiasts from all of North America and is a popular spot for beginners and professionals. Enjoy the clips below and feel free to contact us is you have any questions. 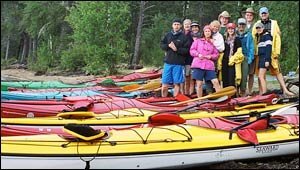 This white water wonderland is only an hour away from Kenora and is a must visit!